DSE recommends RLI for use with children with Down syndrome aged from 5 to 11 years where sufficient commitment and resources are available to plan, prepare and deliver the teaching program consistently for an initial period of at least 20 weeks. Given the findings from the evaluation study, DSE believes that this reading and language intervention is likely to improve reading and language development for many children with Down syndrome. We therefore recommend its use where sufficient commitment and resources are available to plan, prepare and deliver the teaching program consistently. Our study shows that the program can be successfully delivered by teaching assistants. 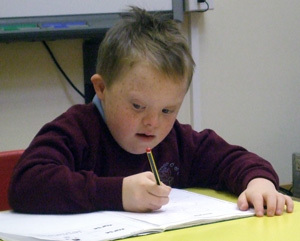 Many primary age pupils with Down syndrome in the United Kingdom will be supported by teaching assistants and we recommend that the intervention is adopted in schools. Other delivery models are also possible. Although, we evaluated the intervention in mainstream schools, it is designed for one-to-one instruction and should be equally suitable for use in special education settings. RLI offers a well-defined structure for individualized reading and language teaching on a daily basis, including weekly consolidation sessions. RLI was evaluated in a rigorous randomized controlled trial. Of 8 children (16%) who made very little or no progress on word reading throughout the study, we can identify 3 who had particularly poor language skills and who were aged 68 or 70 months at the start, two of whom also had relatively poor behavior ratings. This may suggest that children sharing a similar profile may make little progress on the intervention. However, one child of a similar age with similar language and non-verbal abilities did make progress with word reading on the intervention and it is not clear what initial measures could have predicted the lack of progress for the other 5 children on word reading over 60 weeks. In general, children with Down syndrome require consistent, high quality teaching over a sustained period to make good progress. Another study of literacy instruction with children with intellectual disabilities including children with Down syndrome reported that it took 1 to 2 years of teaching before some children made gains. We recommend that teachers monitor the children's progress carefully, using the tools provided with the program, to ensure that individuals are making progress with the skills and knowledge being taught. The program provides guidance about how to adapt teaching to meet the needs of children who are progressing more slowly.